Google has recently announced the release of AMP Story, an addition to the AMP Project. This addition is a new, mobile-focused content format to deliver content as visual, tap-through stories. 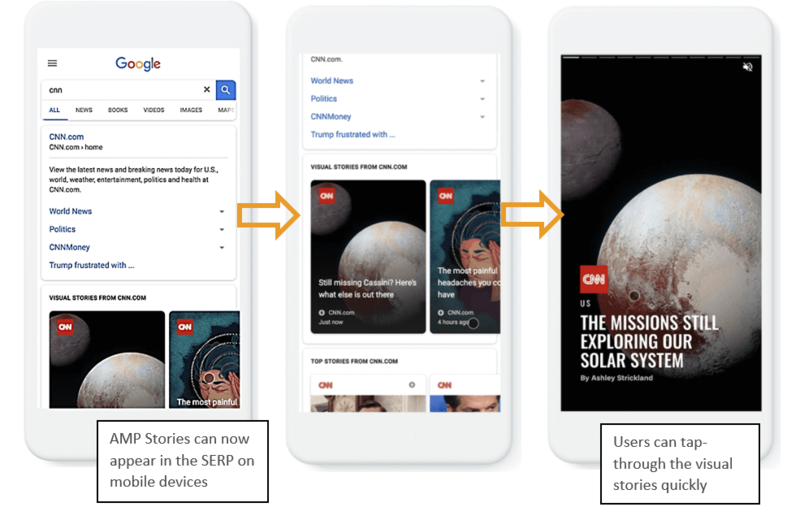 Furthering the push for a mobile-first Web, Google created AMP Stories to give content publishers a visual form of storytelling. This AMP Story addition follows the current “stories” trend, such as what Snapchat and Yahoo News Digest platforms provide. It will provide users with a more immersive search experience by allowing them to view content by tapping through images, videos, and graphics. AMP Stories exist as their own URLs, and although Google does not explicitly require HTTPS URLs, it is best practice to use the HTTPS protocol to ensure AMP pages take full advantage of all AMP features. Some AMP elements only load correctly using HTTPS, such as videos and iframes. Due to the nature of AMP Story content, most likely containing elements such as video clips, Performics strongly recommends implementing AMP content using the HTTPS protocol. The entire story is represented by the amp-story component, which serves as a container for all the pages in a story. The amp-story component is also responsible for creating the UI shell, including the handling gestures and navigation. Like all custom components, you must add the associated script for the component to the AMP document. The associated AMP Stories script is required in the <head> section to specify the document is an AMP story, and the <body> element must have only one child, the <amp-story> element. This means that there can be only one AMP Story per URL. In order for an AMP Story to be valid, at least one page needs to exist. A page within an AMP Story is represented by the <amp-story-page> component. One or more page components can exist, each containing the individual screens of a story. The first page you specify in the document order is the first page that displays in the story. To create a page, add the <amp-story-page> element as a child of amp-story, and assign a unique “id” to the page. Within the page, there needs to be at least one layer. Layers are stacked on top of another, with the first layer being the bottom layer, and the next layer on top of that. To create a layer, add the <amp-story-grid-layer> element as a child of the <amp-story-page>. If the image should fill the screen, specify this with the template=”fill” attribute for the amp-story-grid-layer. Inside the layer, add an <amp-image> element for a .jpg file, and make sure it’s responsive (i.e., layout=”responsive”) with the image’s dimensions. Header (<h1>): A heading usually that exists at the top of the grid. Text (<p>): Bylines are strings of texts that can occupy in one, or all, of the thirds of the grid. Quotation (<q>): Quotation elements, which can also exist at the top, middle, or bottom of the grid (if specified). Image: Images should be responsive and contain the size specifications. Video: To add a video element, add the required script for the amp-video component within the <head> section. Use the template= “fill” attribute and specify the responsive dimensions. Specifying a poster image (a preview image to appear before the video starts) and setting the video to auto play are both required steps for videos within AMP Stories. Animations: Enhance an AMP story by applying animation entrances to elements inside a page. For example, you can make your title fly in from the left, or drop into the page, or fade in, and so on. This last “bookend” screen wraps up the story, and provides social sharing and related links to the story, so users can share the story or dive further into other content on the site. The information on the bookend screen comes from a JSON file specified by the bookend-config-src attribute in the <amp-story> component. To create the bookend, add the bookend-config-src attribute pointing to the associated .json file in the amp-story-element. The first question on many marketers’ minds is how Google will treat AMP Stories, compared to traditional HTML pages in its mobile search results. So far, Google has made no explicit indication of how it will rank AMP Stories. Although Google continues to push prioritizing site speed as a ranking factor, and adding special markup to search results to increase mobile friendliness, the performance improvements that come with AMP are bound to confer some amount of organic search benefit. So far, though, there is no evidence that Google will give AMP Stories preferential treatment. Although search engines do not explicitly state that they rank AMP Pages and Stories higher than other pages for the sole reason it that it’s “AMP” content, if a brand’s mobile experience isn’t as fast and seamless as AMP content, users will most likely migrate to competitors’ sites that offer superior performance. Content should be created exclusively for AMP Stories, and it should be able to standalone. If publishers simply repurpose existing content to use in AMP Story format, there could potentially be canonical and content-consistency issues. Content that is “a highly compelling and visual story that you can tell in a few slides”, will gain higher engagement if formatted as an AMP Story. For example, if information can be communicated to an audience better through images than text, it would reap more benefits as an AMP Story. Users would be able to absorb content more quickly and efficiently, improving user experience. Visuals catch an audience’s attention more easily, and AMP Stories within the SERP would be no exception. Users would more likely click through to visual content in the SERP, increasing CTR. Other performance metrics such as Time Spent on Site and Bounce Rate would also improve, both being factors that Google takes into consideration when deciphering a page’s rank. Since the AMP Project is designed to push for a mobile-first Web, Google will only continue to create more additions to this project. Now with AMP Story, it is more important than ever for brands to implement a mobile-first strategy. Should brands be using AMP Stories? Brands should only use the AMP Story content format if the content being published aligns with the format of visual storytelling. The risk of duplicate content and canonicalization issues can occur if AMP Story content isn’t independent of AMP page or HTML page content. If brands have content that would provide a better user experience in a quick, visual format, then the AMP Story format would be beneficial to utilize. Fitting text-heavy, long-form content into a tap-through content format would actually cause user frustration, and lead to negative impacts for the page. The benefits of using AMP Project content formats are explicitly for mobile rendering speed. The wider adoption of AMP will likely create user demand for AMP frameworks when selecting results in the search engine results pages (SERP) knowing that their usage will be a more enjoyable experience. It’s possible too that Google and other search engines will begin to favor these faster-rendering pages for the exact same reason in the near future. Google’s AMP Story addition to its AMP Project initiative shows that the push for a mobile-first web is stronger than ever. This update allows brands to share content in a new, visual way in the mobile SERP, while providing users with a better user experience if the content correctly aligns to the visual format. In order for brands to gain success with AMP Stories, the content should naturally communicate easily through images, and be independent of existing content. Performics recommends creating AMP Stories using HTTPS URLs, and to follow the best practices when creating the content. For more information on the implications of AMP Story, contact Performics today.